The tutorial shows how to combine VLOOKUP and IF function together to v-lookup with if condition in Excel. 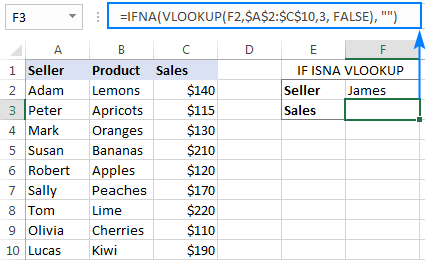 You will also learn how to use IF ISNA VLOOKUP formulas to replace #N/A errors with your own text, zero or blank cell. Whilst the VLOOKUP and IF functions are useful on their own, together they deliver even more valuable experiences. This tutorial implies that you remember the syntax of the two functions well, otherwise you may want to brush up on your knowledge by following the above links. Vlookup with If statement: return True/False, Yes/No, etc. One of the most common scenarios when you combine If and Vlookup together is to compare the value returned by Vlookup with a sample value and return Yes / No or True / False as the result. Translated in plain English, the formula instructs Excel to return True if Vlookup is true (i.e. equal to the sample value). 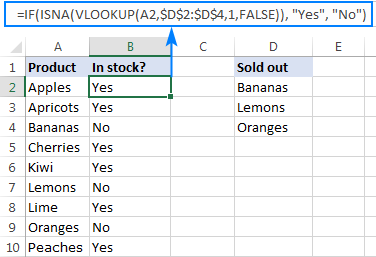 If Vlookup is false (not equal to the sample value), the formula returns False. Below you will a find a few real-life uses of this IF Vlookup formula. Let's say, you have a list of items in column A and quantity in column B. You are creating a dashboard for your users and need a formula that would check the quantity for an item in E1 and inform the user whether the item is in stock or sold out. In a similar fashion, you can use any other logical operator together with a cell reference in your Excel If Vlookup formula. Besides displaying your own text messages, If function with Vlookup can perform different calculations based on the criteria you specify. Taking our example further, let's calculate the commission of a specific seller (F1) depending on their effectiveness: 20% commission for those who made $200 and more, 10% for everyone else. Where A2:A10 are seller names and C2:C10 are sales. Naturally, you can type any text you like instead of "Not found". Supposing, you have a list of seller names in one column and sales amounts in another column. Your task is to pull a number corresponding to the name the user enters in F1. If the name is not found, display a message indicating so. If the logical test is TRUE (#N/A error), your message is displayed. If the logical test is FALSE (lookup value is found), Vlookup returns a match normally. Tip. If you'd like to trap all sorts of errors, not only #N/A, use VLOOKUP in combination with the IFERROR function. More details can be found here: IFERROR VLOOKUP in Excel. Experienced Excel users know that the VLOOKUP function is not the only way to do vertical lookup in Excel. The INDEX MATCH combination can also be used for this purpose and it's even more powerful and versatile. The good news is that Index Match can work together with IF in exactly the same way as Vlookup. For example, you have order numbers in column A and seller names in column B. You are looking for a formula to pull the order number for a specific seller. In a similar manner, you can use Index Match in other If formulas. This is how you use Vlookup and If statement together in Excel. To have a closer look at the formulas discussed in this tutorial, you are welcome to download our sample workbook to Excel If Vlookup. I thank you for reading and hope to see you on our blog next week! 63 Responses to "VLOOKUP with IF statement in Excel"
I created two sheets. sheet one contains full data base with date and name , In sheet2 I have form submission lead , That is date and name with other data's. Here i need to make display other data in sheet 2 related to the particular Date and name from sheet 1. For us to understand your task better, we need to look at your data. If it is possible, please share your workbook with the source data and the expected result with support@ablebits.com. Please shorten the tables to 10-20 rows/columns and do not forget to include the link to your blog comment in the email. We’ll look into your task and try to help. I have two spreadsheets. Spreadsheet "A" has a list of part numbers and sell prices. Spreadsheet "B" has the same part numbers plus more which spreadsheet "A"does not have - including prices. When I populate prices from SSHeet "A" to SSheet "B" using VLookup, where there is no data from Ssheet "A", I naturally return a #N/A. 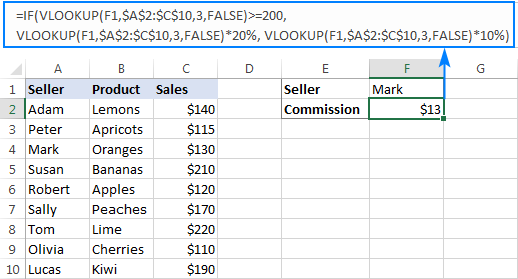 So what I want to do is somehow create a Vlookup formula where I can also include a formula which will use another cell in SSheet "B" where I have a cost of product and apply a margin to that cost and do this all within the VLOOKUP formula. Is this possible? I do not exactly understand the part where you apply a margin to the cost, but I believe the general idea is feasible. You coulod nest IFERROR within VLOOKUP as shown in this example. Hi , I saw your solutions and im impressed, maybe you can help me as well ..
Is this possible or do i need to use another formula ? I have calculated a 'x' value in a cell by using formula. Now I have to use that 'x' value in vlookup by giving cell address but it is showing error #NA. Could you please help me out. I want vlookup to use the value from a particular cell address which is calculated by a formula to show desired result. It's hard to say why you are getting the #N/A error without seeing your data. Can you post both of your formulas here, the one that calculates "x" and Vlookup? Thanks for the help, is it possible to, when the vlookup finds a match it then displays the data in another column on the same row as the matched data? essentially I have a two lists of orders and have compared the two to find orders that have doubled up. At them moment I have to then find the entry and manually find the dates to see when the double up occurred, if i could automate that it would save me a bunch of time. i want to merge both formula in cell F19. can it possible...?? In second formula if i select another option replacement of "NUMERIC DISTRIBUTION %" (K14 is validation list) than run only vlookup formula. Can someone help me with a formula (not sure if its even possible). I'm trying to create a tracker of lets say i choose an option from a drop down menu in E9, i want all the Cells From F9 to N9 to automatically populate(I figured how to do this already), but what i'm really trying to figure out is if there is a way to have cell F9 (if blank) to insert a date 1 year before a date in cell C9. Hope i'm making sense. We are a small manufacturing company in Texas. I verify material receiving dates against PO due dates with the falling formula. A spreadsheet for receiving and one for purchase orders. The problem is if the due date field in the PO spreadsheet doesn't have a date, then it comes back with a "N". Making it appear that we did not receive it in time. I was wanting to only target the dates in the PO master (due dates) that have a date in the cell. I've been trying to get everyone to put in an appropriate due date, but not everyone wants to get on board. Any help would be greatly appreciated. Is there a way to choose which data is displayed with the IF formula based on the text in a certain column? Example: If column A is red it will display the information from column B, but if column A is any other color it will display information from column C? Please show me how to fix it by using IF.?? Need help. Need to do vlookup for spreadsheet containing countries and accounts codes. How can i match the account code in each countries. I need to get the correct mapping of Final account for France and same with other countries. I've created a spreadsheet across 3 tabs which shows performance data from a team of almost 40 people. I would try the VLOOKUP and see how that works. You can use the INDEX MATCH option as well. The article, "Excel VLOOKUP tutorial for beginners with formula examples" here on AbleBits would be a good place for you to start. In your case the VLOOKUP from another worksheet might be the way to go. 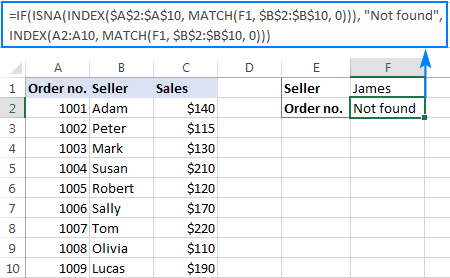 Suppose if the value of column A = " exact as X"and value of column B="exact as Y", formula should result the value of Column C.
There are great examples on here which I have used but struggling with something I am not sure is possible. I need a vlookup with an if that continues down the list. Sorry pressed enter by mistake.In simple terms I need a formula that looks up an entry and if there is also specific text in the same row returns a YES. It only seems to work on the first hit in the list. The word tyre in e1 ! This returns a NO which is incorrect. If I go to the cell above A2 where it says "Tyre" and BT is "warehouse" and delete TYRE it then returns YES against "onsite" formula . I basically want to look up a value in a table and if a entry on the same row is a specific piece of text give me a yes. The value may be repeated several times the text will be one of a few things. I appreciate I will need a formula per entry "warehouse", "onsite . I think you'll be better off using INDEX. I built a little sample sheet using your data and I had some fun with it. There are a few things to note about this. First off it is an array formula so when you enter it into the formula bar put the cursor in the formula somewhere and click CTRL+Shift+Enter at the same time. When you do you'll see the curly brackets around the entire formula. 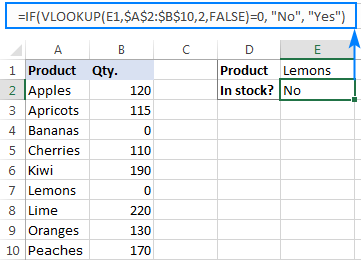 Second, the last "1" in the formula is telling Excel which instance of the item in the list you want to return. If you change the "1" to "2" the items second instance in the list will be displayed. Change the "2" to "3" and the items third instance will be displayed. This will be useful if you enter "First Location" in cell I22 and "Second Location" in I23 and so on. Then enter the formula in H22 with the "1" and enter the formula with a "2" in H23 and so on. You're returning the location of each of the items. This way each of the items location can be displayed by selecting the items instance in the list. You can show where the Tyre is in every location. 1 might be warehouse, 2 might be Germany, 3 might be On-site, etc. Finally got back round to looking at it. Thanks Doug I would of never thought of that formula at all !. I have done what you said and edited the +1 to +2 etc, and it continues down the list so thanks ever so much for the help. I'll begin by saying I am relatively new to using Excel (~1 YR). Essentially the exact same items in three different lists (or one list and two tables) in different order. Basically I want to take the top 2000 items by units sold and use vlookup to find matches in the top 2000 items in the other two list sorts. I am thinking along the lines of a IF vlookup table1 AND vlookup table2 -- but I am not familiar enough to input the appropriate formula. I'm not sure if this is possible, but figured I would ask. I have 1 column (354 rows) that include a unique query string in each and want to search that string for an account number (5-6 digits long). I have another column that lists all the possible account numbers to do a lookup against. Next to that column, I have a column with account names for each account number. I'm looking to see if it's possible in new column to return the account name associated with particular account number IF that account number is found in the query string. Let me know if I explained what I'm trying to do correctly and if this is possible without parsing out the account number from the long query string. I have emailed support@ablebits.com with a file (AJB Test Data) that I need help with please. I currently have a long IF calculation running over many columns to obtain the correct data that I need, but there must be a shorter way of doing it using Vlookup or Index Match maybe? In the Data Tab I need to use columns A and B to look up the corresponding column and cell on the Data 2 tab, then place the answer in the Data Tab, column C against the corresponding row. In essence there are two cells to match up to locate the correct data. In my working copy there may be up to three cells to match! Help would be greatly appreciated. Thank you. In Excel, I have 2 sheets. One is titled "Equipment" and the other is "Technicians". What I would like to do is, on the Technicians sheet, In cell F3, I would like it to look on sheet "Equipment" from the range of I2:I17 and look for Gene? If Gene is found, then display the data from the corresponding cell in range A2:A17. This should be displayed in cell F3 on Technicians sheet. Any help would be appreciated! I have a main dataset of about 500,000 line items. I want to lookup the items from 3 different datasets. Each of these datasets has got about 200,000 line items. I want to use the if and vlookup function to return a " Yes" or "No" answer. please see and inform the reason if you want i can share the excel workbook for finding exact cause. Cell A1: "I love puppies"
Cell A2: "I am a fan of dogs"
Cell A3: "Cats are awesome"
Cell A4: "Kittens are my favorite"
I want a formula that will see if a cell contains the words "puppies" and "dogs" and return the result "Dog Fan"
I want the formula to see if a cell contains the words "Cats" and "Kittens" and return the result "Cat Fan" - how do I do this? Could we do 'IF combined VLOOKUP' search a lot of data where located from more than one tabs? if possible how do I do this? It sounds like you need to do sequential, or chained, Vlookups. This can be done by nesting several IFERROR VLOOKUP formulas into each other. An example can be found here: How to do sequential Vlookups in Excel. i am having problems in using following formula, condition is True we get result correct but condition is False we get error. kindly help, pl. Hi. I have two spreadsheets with a list of more than 4k accounts each. I use vlookup with conditional formatting to determine if the same account number is on both sheets. But what I also need to do is, once it is established that the account number is on both sheets, update the balance on one sheet to the other on each account that is matched. Can you help me? I want to compare two columns for comparing students if there is new admission or left school. I need the result in following month in a separate column. That column should contain three words: Enrolled in previous month(if found in both months), new addmission( if found unique), SLC/Struck Off(if not found at all in following month). I need to know the new entrants and leavers, so that I add and subtract these with opening strength(previous month) to get closing strength balance. Duplicate conditional highlights and leaves unqiue,but those who left the school will not be at all in the following month(second column). but it is of no use for me. If any vlookup with three condition is there, it will be fine. thanks rajesh peshiya for your interest in my problem solution,below is format of my data and requirement. 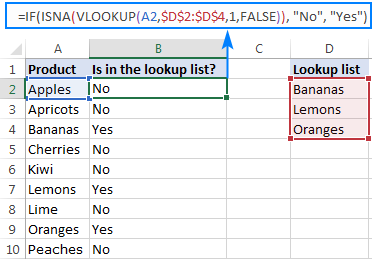 I have query regarding find/search and vlookup. I want find specific text from cell (string) and retrieve data from vlookup table by using this specific text. e.g. “This is a boy” or “This is a girl” is in one cell. (there will more than 100 sentences) In Vlookup table Boy = Male and girl = Female. I want display Male or Female in another cell of same sheet depends on cell string contains boy or girl. I have a list of sales with sold date for different months. I need a formula to pull sales by month. 1) The first argument of the Vlookup function cannot be a range ($C$2-7). It should be either a value or a single cell reference. Also, the correct data range should be written like $C$2:$C$7. You can learn the basics of Vlookup here. 2) Also, you entered excess closing brackets after each "▼" that break you nested IF. Please refer to this article to check what arguments IF and nested IF contain. 3) The very last part of the formula misses the third argument after "=" that would indicate what to return if none condition is met. Please consider these points when fixing the formula. Many thanks! I have removed the brackets and the formula now works! The '$C$2' is a weekly date reference and the '$C$2-7' to get the previous week value. Now I've got those parts of your formula as well, thanks for the explanation! Hi All, Please kindly help me check if the below formula using if and vlookup is wrong? I got the outcome of the vlookup value as yes which is correct but for value that were not found, I`m getting as #N/A instead of the suppose return value of "No"
How to combine this 2 formula? looking to create a spreadsheet with some complexity with user input and data supplied. Willing to pay for its creation, but need to discuss with someone for details? what is the best forum to find someone? In the second sheet, there is a cell "Date of presenting the leave"